Henry Lizardlover raises many lizards in his home. In time, Henry's pet lizards developed superior qualities, unusual calm and trust around people, they became willing to pose in human like ways for photographs. Henry enjoys sharing his ideas and experience on IGUANA BEHAVIOR AND HEALTH CARE... and to promote cultivation of conscious lizard love, because lizard love is the fulfilling of the law. 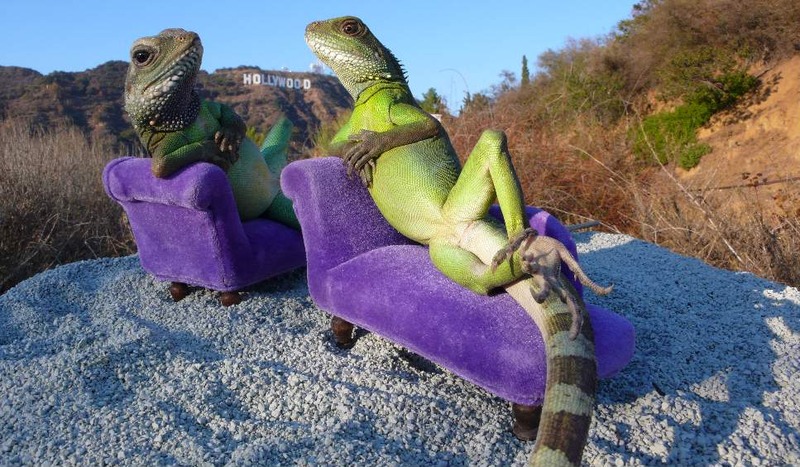 Presented on this website is a photo series of real, live, pampered pet lizards. NO tricks of any kind were ever used (*see below for more about that). Let there be more lizard love, and better understanding with an end to the old reputation they have acquired among society as mindless, disease-carrying, scary creatures, but this is really NOT to encourage anyone to get a lizard as a pet, as so many lizards stay scared & freaked out, and IGUANAS get too large, while some, not all, (same as humans) turn seriously violent, a truly dangerous dilemma for owner and the pet. 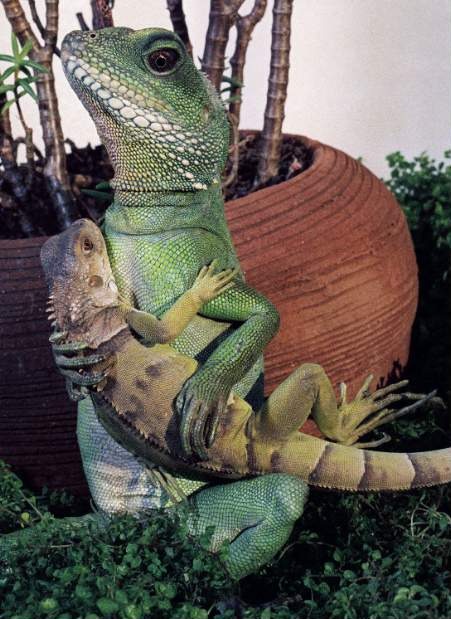 A safe, friendly environment helps a lizard build trust and grow out of the primal state. Step by step, on the stairway toward the civil and harmonious lizard life. By careful cultivation or fluke of mere happenstance, the New Lizard may be born, to what degree, there's no guarantee. It's a wonderful thing that happens in some (NOT ALL) lizards, they can develop precious calm, trust and intelligent behavior, with accurate memory. 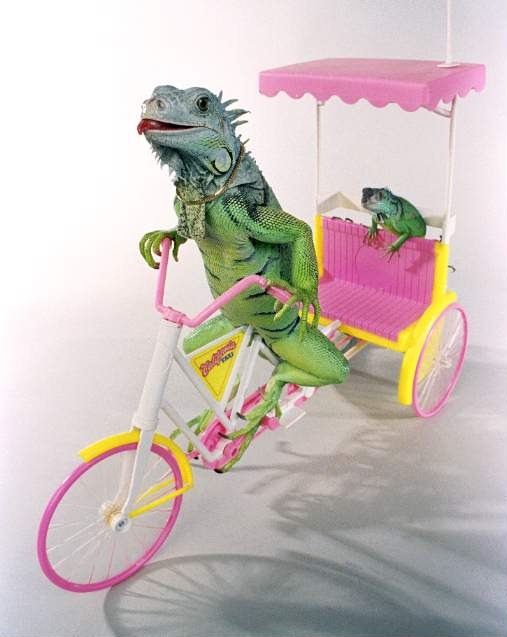 One example, they have the ability to observe behavior of other creatures that appear in the domestic environment, detecting whether the dog, cat or human is acting in a threatening or non-threatening manner, then the iguana is willing to live in peaceful harmony with them, while avoiding ones that act in threatening manner. Just one of many examples of intelligent behavior. 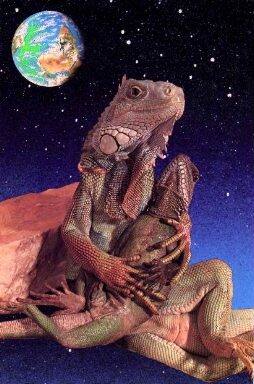 UNFOLD YOUR LIZARD LOVE - Many people fear lizards or lack lizard love, but hearts moved are hearts improved. 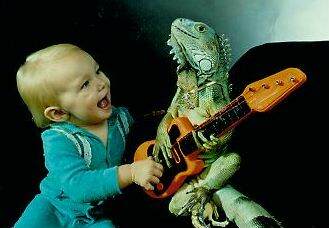 To see lizards do the unexpected is but one of the mysterious ways that can stir us up with radical amazement and the sense of awe and wonder, which can bring on mystic crystal revelation, and the lizard lovin' good vibrations that pave the way to flows of conscious lizard love. It is good, because lizard love is the fulfilling of the law. *NO tricks of any kind with lizards or photos* Completely false are ideas that any of these lizards are posed by the help of low temperatures, belly rubbing or that they can't breathe when in poses. NOTICE.... So many iguanas make for HORRIBLE and difficult pets, some become serious mood swinging attack machines, very dangerous, better to adopt a dog or cat instead. 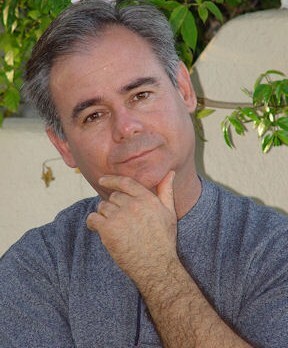 calm and willing to be photographed in the Hollywood Hills, NO tricks of any kind, NO "Photoshop" work in this photo). There is no intention to encourage anyone to seek out lizards/iguanas as pets. 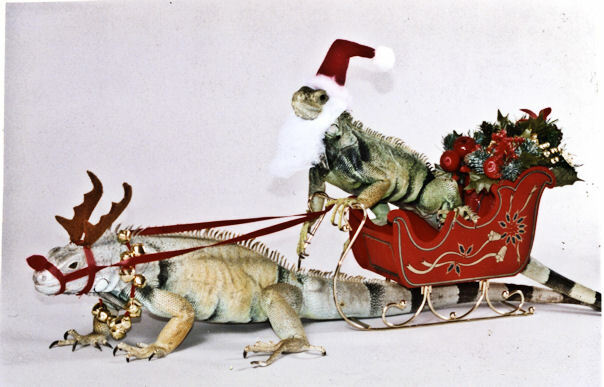 It's important for me to shrug off old stereotype views of lizards. Lizards have potential for good and intelligent behavior, it's all something to be recognized and admired in them. This does not mean it's time to run out and get a lizard for a pet, especially since so many of them will become horrible pets. I've lived with particular lizards that demonstrated impressive behavior, such as calm, trust, memory of people, places, animals, cars, etc. 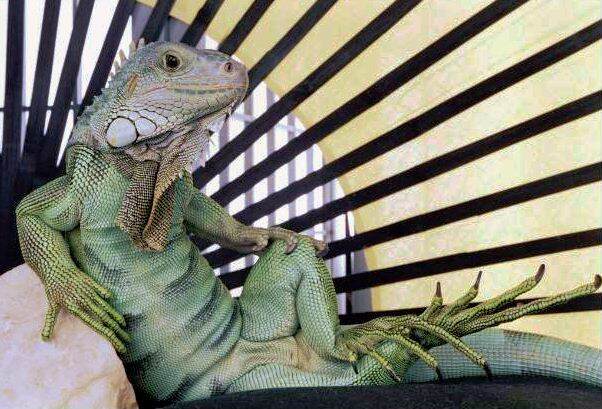 And just like humans, I've seen various forms of egocentric and violent behavior, especially in iguanas. Lizards are individuals, creatures that vary in significant ways from one and other, especially in sensitivity and temperament. They are individuals, so much like people, there are ones that naturally become very calm and civil while others are overwhelmed with fear and have difficult behaviors, no matter how well you raise or treat them, that they have various forms of intelligence, have all kinds of body language, human like behavior, human like character and ego, that they truly want to live and enjoy being alive and basking in the sunshine just like people. 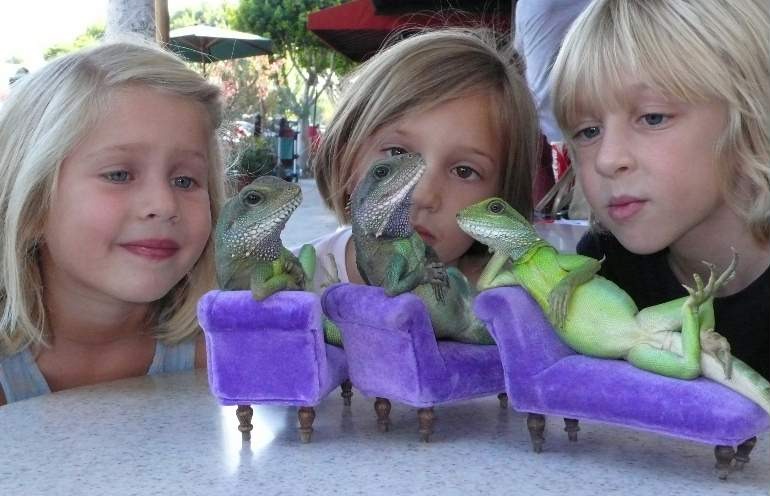 BUT, as pets, iguanas are a big gamble to get involved with. They get too large for most people to deal with. Iguanas, that is the male iguanas, also pose a possibility of getting into serious aggressive breeding season moods once they grow up and there's NO way of preventing that behavior, no way of knowing ahead of time whether your iguana that you raise will or will not develop a serious attack mood and change from being sweet pet to raging bull. I've always had the company of various pets like birds, rodents, cats, dogs, turtles and lizards since I was a young kid but it was not until I got a bit older when I eventually encountered some particularly wonderful iguanas with such impressive character and behavior that it would awaken in me a new appreciation and understanding of lizards and animals in general. 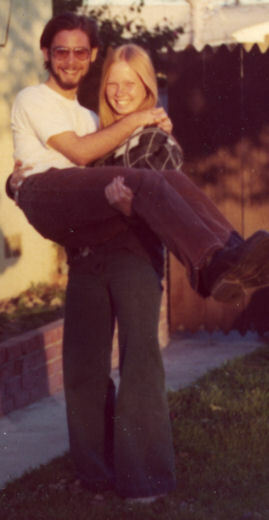 The year was 1982, I entered a new phase and focus just on lizards, and started to collect large groups of iguanas and other lizards in my home. 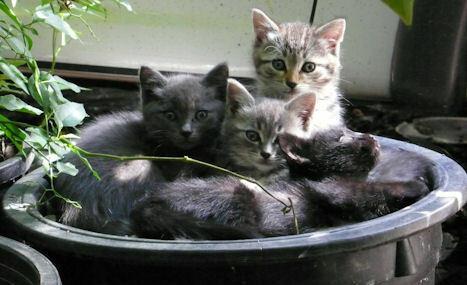 Prior to that, I was already raising 3 Chinese Water Dragon lizards. They had developed very calm and fearless behavior which impressed me at the time, so yes, I decided to go all the way to having a house full of lizards by collecting iguanas, to keep in my home as pets and eventually as subjects for a photographic project I wanted to do, which later became the images I would use on a line of post cards and greeting cards. I had plenty of room in my house and garage and the time was right. 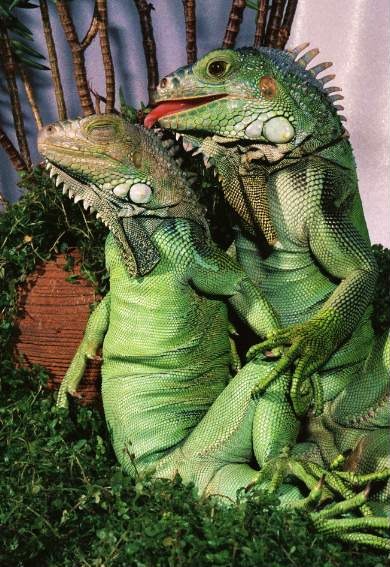 This was all long before the iguana fad and frenzy of the 1990's, when iguanas were not popular pets and very little was written about them and long before the obsessive trend to make iguana diet and care into a rocket science on the internet, (more on all this on an upcoming page). Early on when I started collecting iguanas, I got all the vital but SIMPLE tips and basic principles that covered iguana diet, health problems and general care from a wise older veterinarian, DVM Clyde Pitts of the Studio City Animal Hospital, (around 1983). DVM Pitts briefed me 1) on the all-important role of providing occasional DIRECT (NOT through glass) sun-light to generate vitamin D for the bones and or by providing a true functioning artificial florescent light source, needing to be used within 12 inches to the lizard, which is a specially designed florescent type light that puts out UVB rays similar to sunshine (but not nearly as effective or reliable, actually about 100 times weaker, reported figures show that 8 hours at 6 inches distance from this light only generates about 5 minutes of sunshine. 2) Besides the all important sunshine vitamin, so necessary for the iguana to utilize calcium, Dr. Pitts explained the absolute necessity (but also a simplicity) of a diet primarily comprised of true CALCIUM rich vegetables (such as collard greens, turnip greens, mustard greens, dandelion greens, etc., instead of "lettuce" which is so sadly lacking and lonely in calcium, leaving so many iguanas with major bone failure), which is what so many people get the idea to feed as the sole diet for iguanas. After that, it was all rather clear to move forward and learn on my own as I went along throughout the years in raising hundreds of iguanas, but I always, always, kept in touch with certain top vets (specializing with iguanas/reptiles)and was always eager to read up on any books that came out on iguanas, along with any information and talk about iguanas on the internet since 1995. By the way, contrary to what you find claimed again and again on the net, there have actually been very few "NEW" advances or changes to come along in the way of iguana diet. The idea of providing glass free sunning sessions or a TRUE UVB florescent light source, while avoiding a diet that's merely lettuce and or avoiding loads of animal protein in the diet, and instead, going with a diet that's simply a VARIETY of CALCIUM RICH GREENS is pretty much the sum total of the long list of great advances and "Updated" knowledge on diet to have come along throughout the years. Back to the story..... (From 1982 until 1998) I maintained a group averaging 30 to 50 iguanas, sometimes even more besides the other groups of lizards that I also got into collecting, such as Chinese water dragons, Solomon Island tree skinks and Sneider skinks. 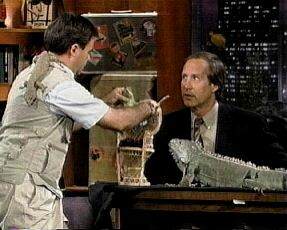 The lizards became more and more of a fascination for me, I developed a total commitment to them. I felt sorry for lizards I would see in pet shops and knew I could give some of them a good home at my place and place some in other "qualified" homes, which went very well. 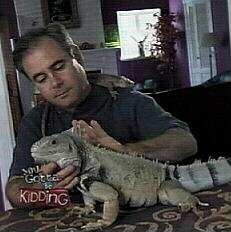 I raised hundreds and hundreds of iguanas and other lizards throughout the years while always maintaining a large steady group of personal favorites AND ones that were difficult and not suitable for placement in other homes. By actually living with a large variety of iguanas and other lizards, I came to realize things about them that few people ever have a chance to see even with the experience of raising one or even 21 iguanas. It became clear to me that people all too easily fall into the mistaken idea that their experience of raising one or a few iguanas is going to give them an accurate view of how ALL iguanas are going to be, especially in the area of behavior and character. 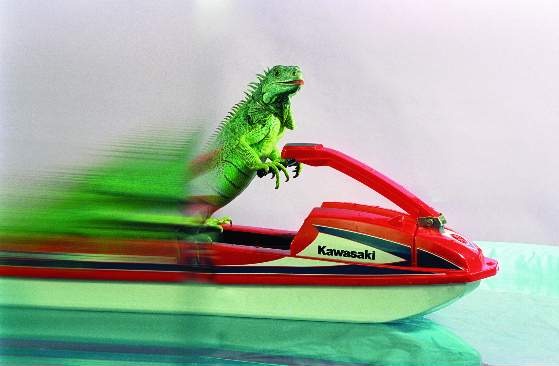 When in fact, there is a radical variation in behavior and personality among the whole population of iguanas. The temperaments will vary as much as they do among humans. I was so impressed to see a natural ability of so many iguanas to adapt and get along with humans in ways that a cat or dog will. I found that once the iguanas/lizards feel safe and take on their potential state of calm if and when they develop a relative absence of fear, they will have and demonstrate all kinds of intelligence and civil "tame" behavior, *automatically* on their own, without any "training" but again, this is going to vary among different iguanas, under the exact same conditions, there are still going to be a variety of different temperaments and behaviors. They can develop amazing qualities of real trust and harmony around humans and other friendly animals, which again, all varies greatly with each individual lizard, and this all became tremendously inspiring to me to see such behavior in "a lizard" and really worked to give me a much deeper appreciation for the intelligence and friendly behavior potentials in not only lizards but other animals and even insects as well. (By the way and generally speaking, Western Science is a wonderful and outstanding intelligence in most ways, but still leaves our culture with an unfortunately limited and low regard for animal/insect intelligence and life, which is a great mistake in attitude and values, I will go into explaining more about that on another page of the site). Back to the story.... I chose to keep certain ones, especially favorite iguanas but also the ones that did not have good enough behavior to offer as pets for other homes. 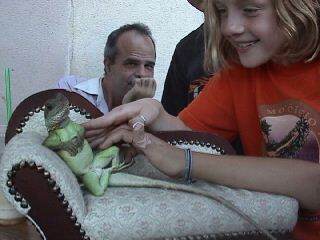 I often had to find good homes for some male iguanas once they became adults and started fighting, there was a limit to the number I could keep, as the males required separate rooms but females did not in most cases. I would find just the right homes for certain lizards, I never offered any iguanas or other lizards to someone I did not know or feel comfortable about. 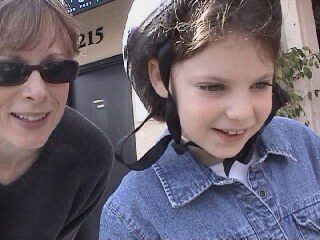 As time when on, I was living and breathing lizards, I incorporated them into all of my activities. 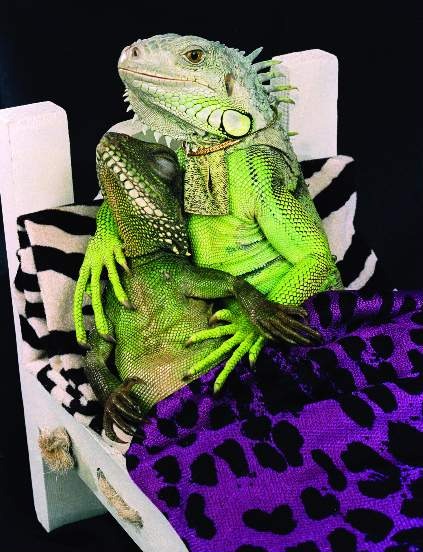 Lizards became a major part of my life, I was even sleeping with one of my favorites, a male iguana that started sleeping by my side from the age of 6 months and for the next 14 years or so. I was taking certain ones with me everywhere I'd go. The only iguanas I would ever take were iguanas that happened to be especially CALM, mellow, relaxed and friendly, they were never feeling any stress or fear on these trips away from home, it's easy to tell by knowing the distinct body language expressed by them. Read about that on this site. I found that I could take some of them out to places like empty parking lots or the mountains and with all the bushes and such, none of these adult iguanas would ever try to leave me, they just pace around bob their heads to show off and explore a little or follow me, but that you have to see believe is that they would go up to my car or truck and climb in on their own, that was always an incredible sight for me to see, something you expect a dog to do but when a lizard does that, it can make you rethink your whole idea of reptiles and small brains. Back to the story. 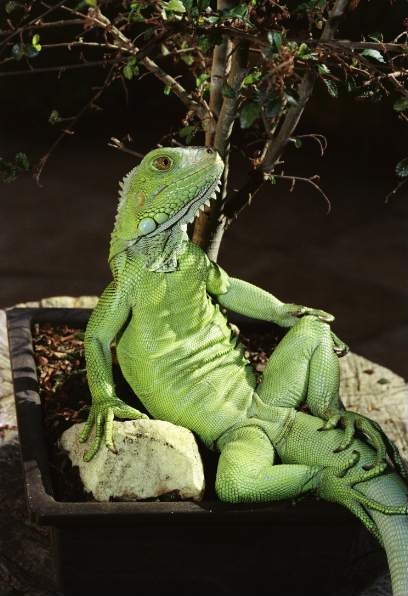 Iguanas were living all over my house and in special sunning rooms set up in my garage. 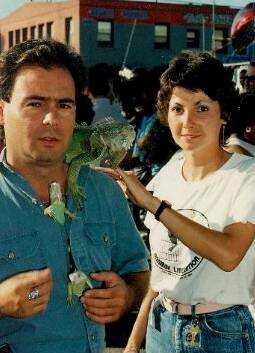 Most all of my iguanas, (except for babies), were not kept in cages but had free roam within certain rooms and pens. 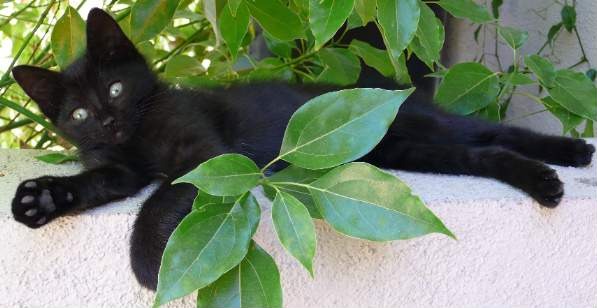 Some could be trusted to wander the house without any restrictions, even wandering outside in the back yard all day long, and always returning back to the house on their own. Seeing iguanas return back into the house or my car were just a few of the example of great behavior and intelligence that I never imagined iguanas to have, things I never found mention of in any iguana books. 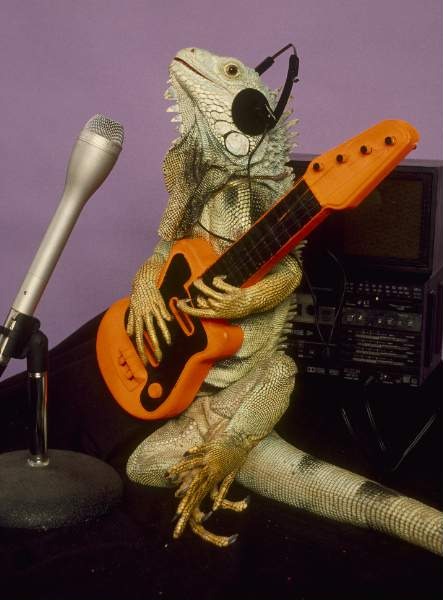 By 1986, I changed my last name to "Lizardlover", to promote my new line of post cards and greeting cards featuring photos I did of my lizards but also to show my love and dedication for my pet lizards, but also to have fun, but also to play with people's heads. It's amazing how many effects a little thing like a name can make. Back to the lizards. The ultimate thing that impressed me the most, especially with some of the lizards is the state of perfect CALM and TRUST they can develop around people, on their own without any "training". This inner calm and trust they are capable of is a most significant thing to behold, something most people do not think a reptile would be capable of. Calm and trust are the very best of "human" qualities, yet it can appear in "a lizard" also, something to really think about and appreciate. I was disappointed that there was very little of any depth written about the character, individuality, intelligence in iguanas. 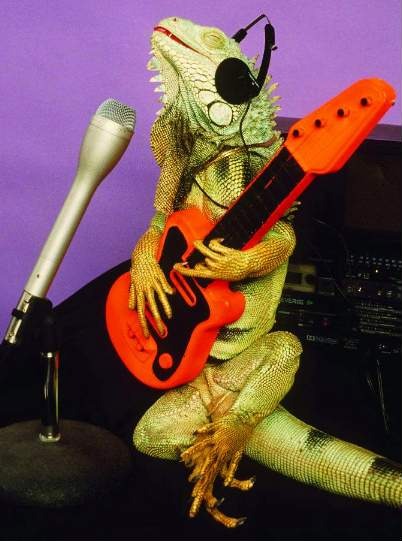 Whatever came to be written later was pretty much limited to diet issues and housing requirements, nothing of any depth regarding the mind and potentials of character and behavior of iguanas. In raising hundreds of iguanas throughout the years, I must emphasize, gave me a rare opportunity for a broad view into their behavior, variations from individual to individual along with everything involved in their care and especially their behavior, that's what's most interesting to me. I was able to let go of preconceptions and the same limited views that most people tend to have of lizards, but my eyes and heart were quickly opened to recognize truly human like character in them. I was especially fortunate to have ended up with some rare individual iguanas that made it possible for me to enjoy and witness the best of potential behavior, to see things that few people ever expect from a lizard. 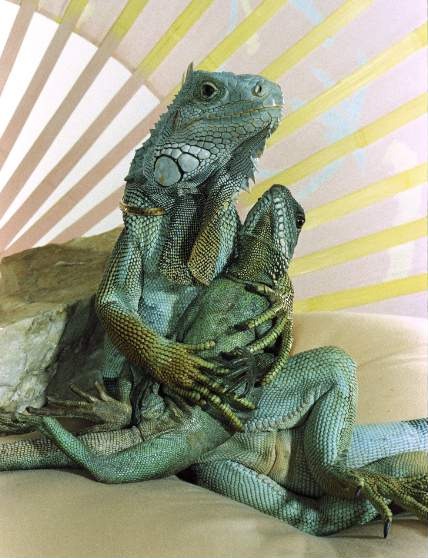 I would put it this way to make the point, lizards are really like people, not lizards. My lizards became so incredibly calm and trusting, I found out they would easily cooperate and sit in human like positions for long periods of time (not stuck or hypnotized, not stressed, not chained down, no tricks of any kind, free to get up and go if they felt like it) which I love to photograph and soon started into production as a popular line of picture post cards and greeting cards. 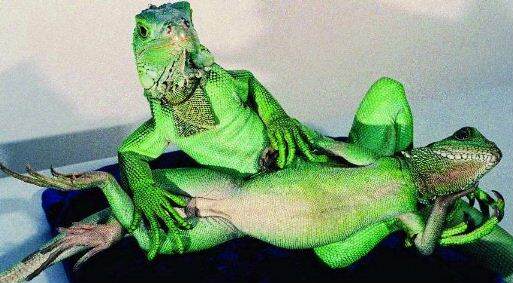 There is a lot of misunderstanding about the posing thing I do with lizards. I will be adding a page to explain more about this posing issue. 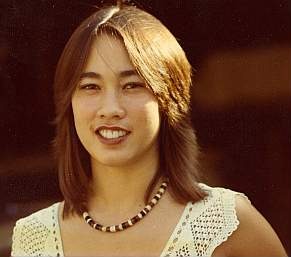 In 1988, what I was doing attracted media attention from all over the world. 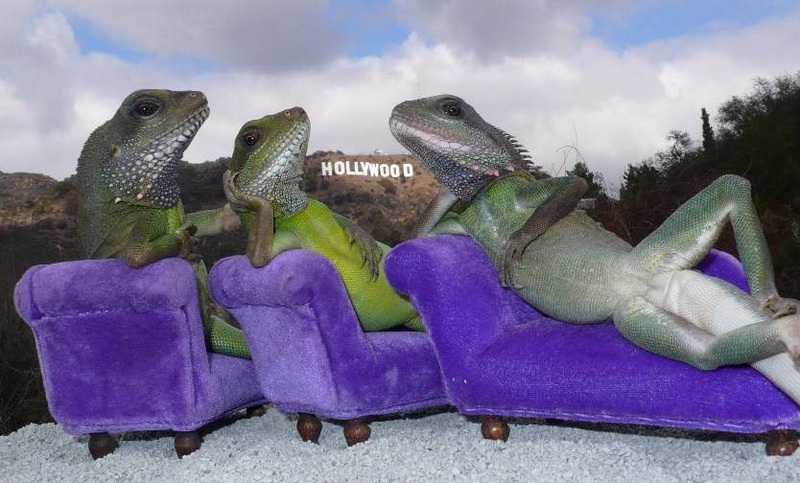 Through out the years, year after year, this wonderful group lizards were featured on numerous TV news, magazine and talk shows, local, national and all over Europe. Newspapers and tabloid magazines did various kinds of stories that appeared in the US and other countries. 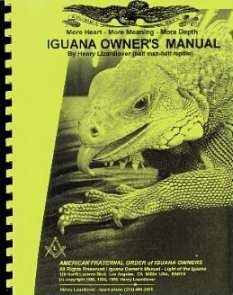 1992, I wrote the Iguana Owner's Manual and started distribution of the book through mail order and various pet shops. NOTICE REMINDER.... This website is under major construction, more information, education material, photos and fun will be added in days to come. This was the first book on the market in 1992 with original insights to fully cover and do justice to iguana character, behavior variations, intelligence, memory, body language, moods and attitudes, male aggression attacks and mating holds on humans (with clear warnings), Variety and mineral rich vegetable diet principles, the vital importance of UV/Sun light, safe sunning, proper pooping, and more. These lizards take a shower every morning and night before bed.